Pianists John and Jean Roberts are among the musicians presenting the "Romanticism Concert," the opening concert of the SFA School of Music's 2009 Chamber Music in the Pines Festival, at 7:30 p.m. Saturday, Aug. 8, in Cole Concert Hall. John Roberts is the new director of the SFA School of Music. A reception for the Roberts will be held immediately following the concert. NACOGDOCHES, TEXAS - The opening concert of the Stephen F. Austin State University 2009 Chamber Music in the Pines Festival will serve as the Nacogdoches debut performance for John Noel Roberts, the new director of the SFA School of Music. Roberts and his wife, Jean, will both play the piano during the "Romanticism Concert" at 7:30 p.m. Saturday, Aug. 8, in Cole Concert Hall. The annual festival's title this year is "Movements in Music," and each of the four concerts will focus on an important musical trend, or movement, in music history, explained Jennifer Dalmas, associate professor of violin and the festival director. "In addition to the 'Romanticism Concert,' we'll have the 'Impressionism Concert' at 7:30 p.m. Tuesday, Aug. 11; the 'Nationalism Concert' at 7:30 p.m. Friday, Aug. 14; and the 'Classicism Concert' at 2:30 p.m. Sunday, Aug. 16." The first concert will open with "Serenade for String Trio in C major, Op. 10" by Erno Dohnányi, performed by guest violinist Ivo Ivanov, guest violist Cornelia Demian and cellist Evgeni Raychev, SFA lecturer. Jean Roberts, Dalmas and Charles Gavin, SFA professor of horn, will then present Johannes Brahms' "Trio for Violin, Horn and Piano in E flat major, Op. 40." The concert will conclude with John Roberts, Ivanov, Dalmas, Demian and Raychev performing "Piano Quintet in A major, Op. 81, B. 155" by Antonin Dvoràk. "The Romantic era was such a vibrant period for chamber music, and all three of these pieces really demonstrate the brilliance and depth of this genre," Dalmas said. Prior to accepting the director position for the SFA School of Music, John Noel Roberts was the artist-in-residence and head of music at the Western Australian Conservatorium of Music of the Edith Cowan University. He has also served on the faculties at Furman University, South Carolina, the University of North Carolina at Charlotte and was the inaugural dean of the Townsend School of Music at Mercer University in Macon, Ga.
Roberts has performed in the United States, Canada, Great Britain, India, Hong Kong, Taiwan, Thailand, Singapore and Malaysia and participated in A Winter Musical Feast, The Alec Wilder annual concert in New York City, and a chamber music festival in Perth, Australia. He has also performed in Hibiki Hall in Kitakyshu, Japan, and presented a series of recitals in Italy. The Texas native received his Bachelor of Music and Master of Music degrees from the Eastman School of Music and a Master of Musical Arts and Doctor of Musical Arts degrees from the Yale University School of Music. Jean Roberts, who was a senior lecturer in the Townsend School of Music at Mercer University and served as the organist at St. James Episcopal Church in Macon, Ga., has also taught at Furman University and North Greenville College in S.C. and at the Western Australian Conservatorium of Music in Perth, Australia. Her performances have been broadcast on National Public Radio and by the Australian Broadcasting Corporation. She has performed with the Western Australian Symphony Orchestra, Penang Festival Orchestra in Malaysia, Charlotte Philharmonic, Charlotte Repertory Orchestra, Salisbury Symphony Orchestra and Macon Symphony Orchestra. Following degrees from Eastman and Yale, the New York native earned a Doctor of Musical Arts degree in piano from the University of Texas at Austin. 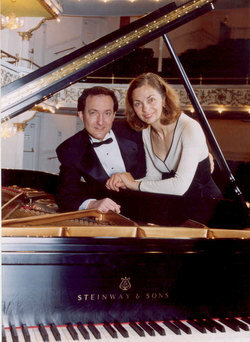 "We are delighted to introduce both of these accomplished pianists to Nacogdoches," said Dalmas. "Jean will be performing on the other concerts as well." Following the Aug. 8 concert, the SFA College of Fine Arts, School of Music and Friends of Music will host a welcoming reception for the Roberts in the lobby of Cole Concert Hall, which is located in the Tom and Peggy Wright Music Building, 2210 Alumni Dr. on the SFA campus. Season tickets, which include tickets to all four concerts, are $30 for adults, $22.50 for seniors and $15 for students. Single event tickets are $10 for adults, $7.50 for seniors and $5 for students. For tickets or more information, please visit www.sfasu.edu/finearts or call (936) 468-6407 or (888) 240-ARTS.